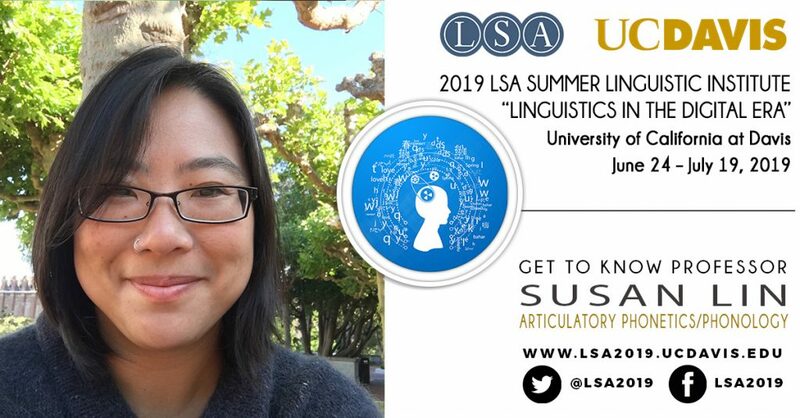 Susan Lin of UC Berkeley, will be teaching a course on Articulatory Phonetics/Phonology at the 2019 LSA Linguistic Institute. In this fun interview, Professor Lin provides some exciting information regarding the course she’ll be teaching at UC Davis as well as her current research. Sure! I got my PhD in Linguistics at the University of Michigan in 2011, under Pam Beddor. After that, I spent a couple years at Macquarie University in Sydney, as a postdoctoral researcher working with Katherine Demuth, before starting my current post at UC Berkeley. Oh man. It must have been 2006. I submitted my very first abstract ever, the LSA meeting in Anaheim (2007). That was an incredible experience! I’ll be teaching a 4-week course on Articulatory Phonetics/Phonology. In this course, we’ll learn about how speech articulation is planned and executed, the relationship between the vocal tract and acoustics, and what articulation can tell us about phonology and the structure of language. Although four weeks is a short period of time, we will also briefly cover some of the techniques used in studying speech articulation and whet our appetites by working with some existing articulatory databases. Your grade in the course will come from three homework assignments and a short proposal for original research or outreach. Right this moment, I am working on a research project initiated by two Berkeley graduate students (Meg Cychosz and Alice Shen). We are testing how well speakers can learn to produce articulatory distinctions that are not part of their native language with and without instruction and/or the ability to view their own tongue (through ultrasound). I don’t know if I have a favorite, but I love to knit, cook, and hike. Probably a software engineer or a high school math teacher. Maybe a sheep farmer. I’m really excited to explore the UC Davis campus! I’ve always really loved things grow, so I’m definitely planning to take advantage of the opportunity to hopefully learn a little more about agriculture and sustainability. Most of all, though, I’m really excited to meet the students! Working with students and learning about their ideas for research and community development/outreach is easily my favorite part of the LSA Institute. Keep your eyes and ears open! We’re so lucky to be able to draw so much inspiration from our everyday lives for our research and teaching.